Well, one of them kind of is. Our family is beginning its annual dispersion. My middle daughter has flown off to start her college career in St. Louis, and my mom and I follow in a tightly packed car tomorrow in order to move her in her dorm on Thursday. While I am on College Duty, Mark and my younger daughter will leave for Paris. I will follow them to Paris a few days after I return from my tour of Highway 59. Being smarter than I look, I packed up a suitcase for Mark to take to Paris for me when he goes. What, that isn’t what your suitcase would look like if you were packing for Paris? 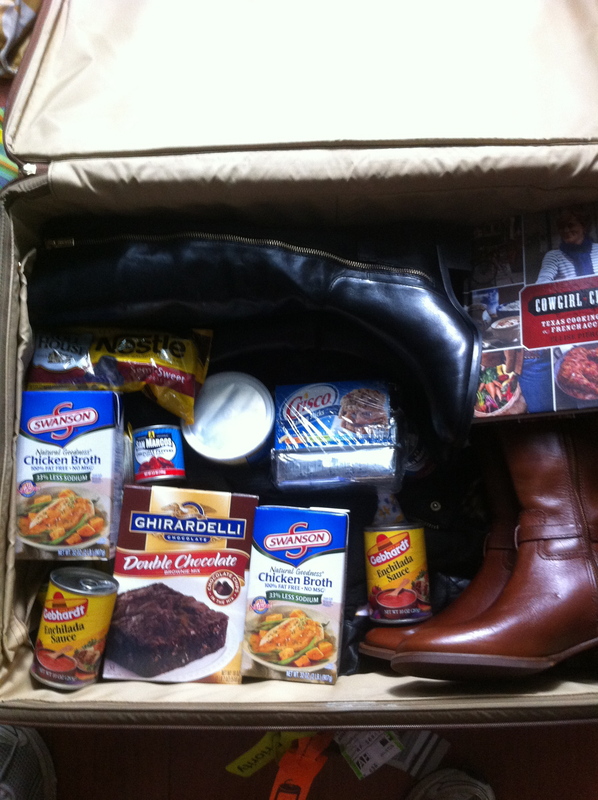 Boots, Cowgirl Chef cookbook, peppers, enchilada sauce, chicken stock- all essentials! Fortunately, La France doesn’t care what food you bring in, probably because they know it won’t compare with what they already have there. So I’m about ready to slide into my car and head east. I am hoping we left enough room in the car for my mom and me and our small suitcases! Be sure and stock up on your Fiesta Spices! We went the 59 route when we took Michael to Mizzou last week. Such a pretty drive unless you get caught in a huge hail storm in the Ozark Mountains. I hope you don’t have that lovely experience and wish for nice clear skies for your trip. We took the scenic route up Hwy. 7 from Hot Springs to Harrison, Ark. I felt like I was driving in an IMAX movie! It was great scenery but I don’t think I need to do that one again anytime soon. Some interesting places to see along the way though – Booger Hollow and Emma’s Museum of Junk. Have a great trip. Good luck to Claire. Eeks. Hail storms are scary on the road. Today was lovely- overcast so temps were low 80’s and really pretty evening. Can’t wait to hear more about Booger Hollow! I lived in Paris for two years and that’s exactly what my suitcases looked like! Kate, Always great to see you and what a wonderful evening being back home on Hermitage. You all look like Paris is keeping you young. I wanted to ask how your parents are doing and if they get to Paris. You are so sweet to always ask about my parents! They are doing fine and have made one trip to see us and are jockeying for another! Will be in Paris 9/7-9/13 so if you forget anything, let me know!